I've blogged before about my favorite (and youngest) pen pals. They are still both writing me regularly, and their letters and postcards are among my most cherished mail. 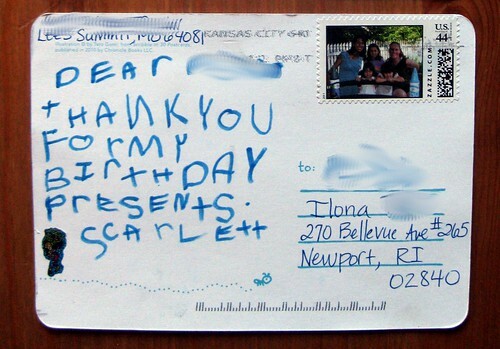 I always give them mail-themed gifts at birthdays and such - usually stationery. The two girls are great about sharing their stationery with each other, and one of the gifts I gave Scarlett for her 5th birthday was such a hit that I had to blog about it. Scribble It! postcards by Taro Gomi, published by the fantastic Chronicle Books, are a magical way to encourage kids to send mail, even if they can't write yet. I thought the gimmick was cute so I sent it along with some other stationery, but being a foreigner to most interactions with young children (with a few exceptions, like these lovely young ladies), I hadn't realized what a hit it would be. Each postcard has a prompt on the front for artwork and such, and room on the back to write. 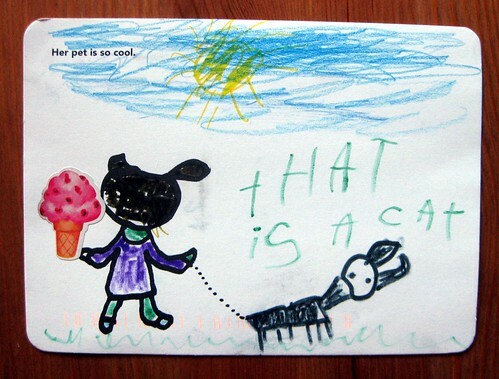 Scarlett chose the "Her pet is so cool" postcard, and drew me a lovely cat... and captioned it "That is a cat." I'm glad she specified - now I know for certain! :-) She added one of the stickers I'd also sent her for her birthday into the artwork. So it's clearly mixed-media: crayon, marker, and sticker. This was a 5th birthday gift for Scarlett, and she is in pre-kindergarten. She has previously dictated all her letters to her mom, and her mom handwrites them -- but this was the first item I've received from Scarlett that she wrote all by herself! I was so impressed. 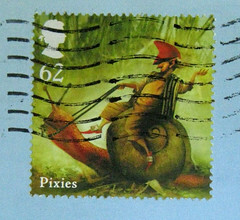 She and her sister both used stamps I sent them, made via Zazzle, featuring a photo of us last summer when I visited them and we all went to a petting zoo together. Her older sister, Annalise, is 7 years old and in 2nd grade - she is my original pen pal and we've been writing for a couple of years now. She writes very well all by herself, though her mom sometimes helps with addressing envelopes and return addresses. She chose the caption "What an interesting hairstyle!" and created a fun hairstyle, with the addition of another sticker. I love the stripes in the background! I would never have had the artistic sense at that age to fill up the space like that. 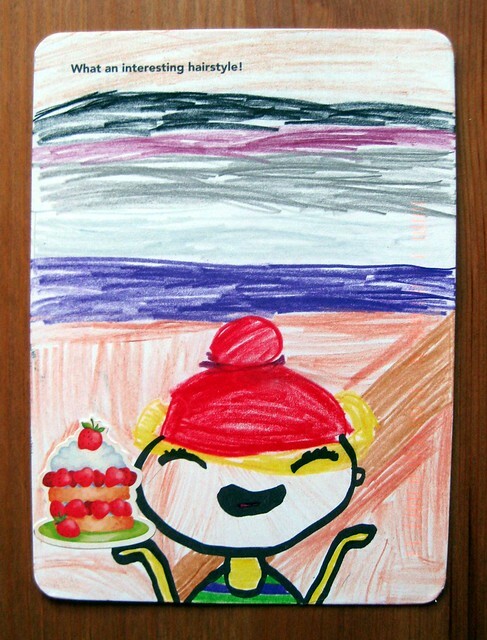 She wrote a very colorful postcard, changing colors every line. Her thanks for keeping her letters was in response to a question she'd asked me about whether I kept the letters she sent, and I assured her that yes, I keep every one of them! Her handwriting is always so neat. 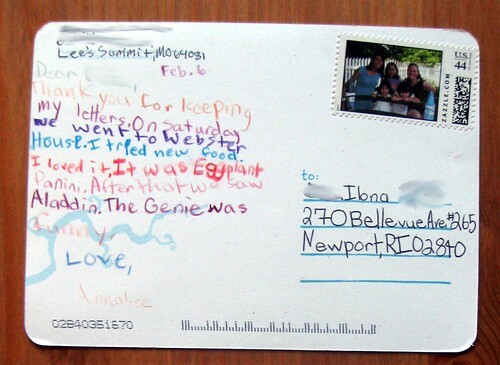 I wish I could read all my pen pals' handwriting this easily. Not only did I want to share these adorable postcards with you, my blog readers, but also to encourage those with children in their lives: start 'em young! My mother made me write thank-you notes as a child, as soon as I could write, and other adults in my life gave me gifts of very cute stationery to make that process fun. And so, my love of mail was born by the time I could write. If you're looking to encourage some kids to send mail, I highly recommend these Scribble It! postcards. I'm linking to Amazon instead of Chronicle Books here because Amazon lets you "look inside," and you can see a number of the cute prompt options. The postcards are large enough that there is room to fit some writing (even large writing from small hands) on the written side. They are over 4x6 so they require first-class letter rate postage and not postcard postage, but they're well worth it. This is now my favorite go-to gift for young children! What a wonderful idea! I used to love having penpals when I was little, but I fear kids are more into computers these days. Well done for encouraging them. Their pictures are adorable! Kids are used to computers these days, it's true - but snail mail is an exciting novelty. I have been pleasantly surprised by how these kids are not tiring of mail, and it's still an exciting part of their lives. Yay! My 4 1/2 year old granddaughter has been into postcards since she was about 1. She has her own Postcrossing account and up until last December had her own post office box. The post office had awful hours, though, so we had to close that and now she shares my box. All her postcards come to me and then I send them to her home address (I don't want to put her home address online). I am going to buy these Scribble It postcard tonight and next week, when I'm in Boston meeting my newest granddaughter (born this week), Savannah and I can play with the new postcards and have them all ready to mail to agreeable Postcrossers. Oh this is super precious! ; w; I'll try to convince the children of family friends to start writing letters and the like. The 'Interesting Hairstyle' postcard got an audible "Awww" from me, just to let ya know. HAHA KIDS?! I'm 22 and I love sending these postcards out. They are so fun and great for personalizing for the perfect person.